It’s going to be for the entire island in anticipation that one day that they’ll be able to extend it into mainland Cuba. Guantánamo has been in the news lately -- not because of the prisoners held there, but because Raúl Castro insists that it be returned to Cuba. 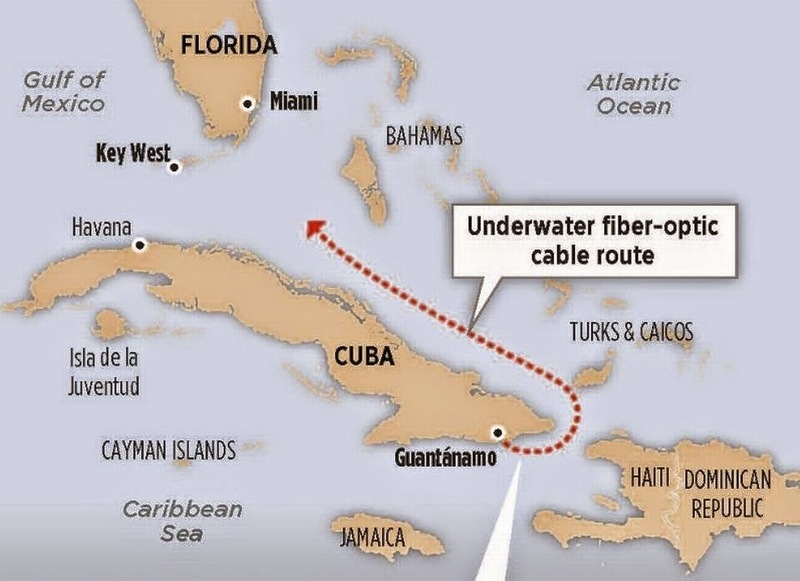 The controversy is over the 45 square mile base, but I have not seen mention of the undersea cable connecting Guantánamo to an unspecified location in Florida. 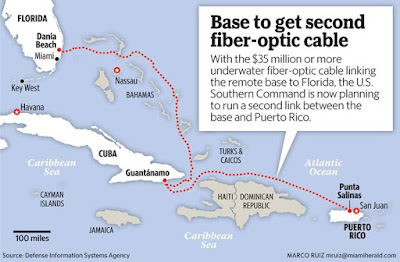 The estimated completion date for the cable is December 2015 and it could become a bargaining chip in US-Cuba negotiations. Bechtold was a civilian employee of the Defense Department at the time he made the statement and was scheduled to retire. Colonel Julian said there was no plan to extend the cable, but plans can change. 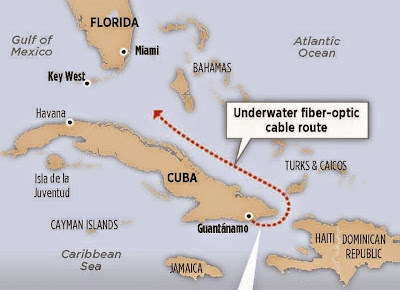 I've not found subsequent references to this cable or its current status (using Google), but it could be a significant addition to Cuban internet infrastructure if they are sincere about increased access. 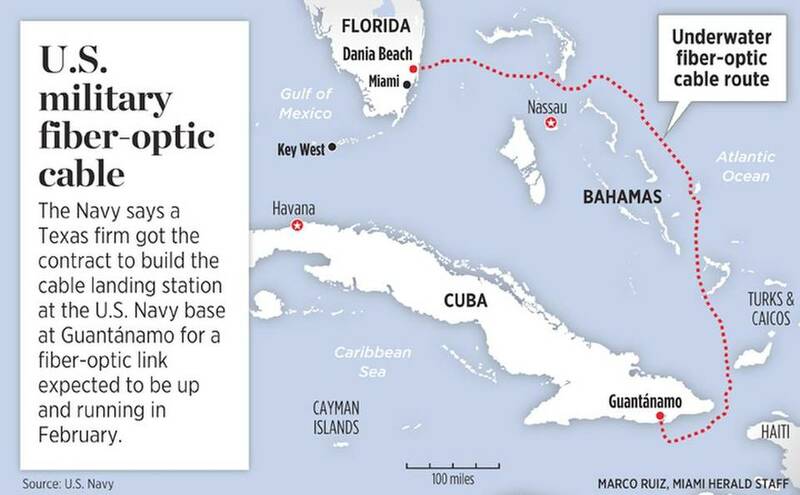 The Miami Herald reports that the undersea cable is expected to begin operation in February, 2016 (Paywall). It will land in Dania Beach, just south of Fort Lauderdale and connect to Verizon's network access point in Miami. Last month, I had a chance to ask a senior State Department official concerned with Cuba whether there had been any discussion of the Guantánamo cable in US negotiations with Cuba and he said there had been none. Slate has published a post summarizing the history of the cable and speculating on possible ways it may be used in the future. 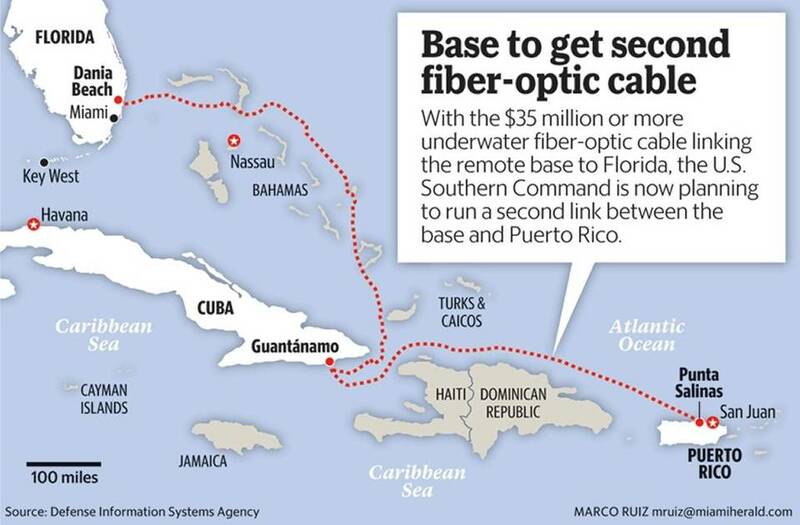 The US Department of Defense has requested bids on an undersea cable from Guantánamo to Puerto Rico. The price tag? They are justifying it as a backup in case of a break in the fiber linking the base with Florida. They had no comment when asked about the capacity and performance of the current cable. On the face of it, this seems like overkill.